TORONTO, ON – (July 28, 2014) – Canadian Music Week is pleased to announce Darren Throop as the 2015 inductee to the Canadian Music Industry Hall of Fame. 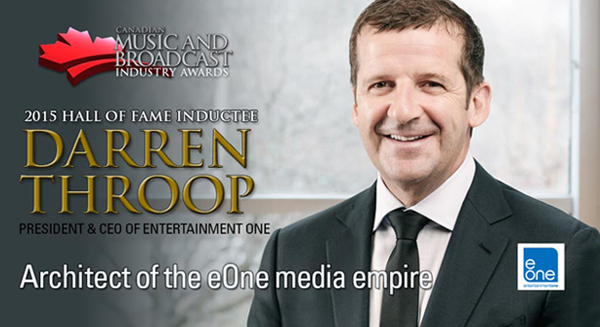 Throop, the President and CEO of Entertainment One and a visionary within the entertainment industry for more than two decades, will be honoured for his achievements at the Canadian Music & Broadcast Industry Awards gala, taking place on Thursday, May 7, 2015 at the Sheraton Centre Hotel in Toronto. In a career spanning more than twenty years, Darren Throop has established himself as a leader in building and managing entertainment companies. At the helm of Entertainment One since 2003, he has developed the company into a leading independent entertainment content owner and distributor, and through corporate acquisitions and partnerships, has expanded the group’s global footprint including all major English-speaking territories. In 1991, Throop founded an independent chain of retail music stores, marking the beginning of his career in the entertainment industry. The next ten years would see him building and acquiring several music distribution ventures – including CDPlus.com and Records on Wheels – before becoming CEO of ROW Entertainment (ROW) in 2001. As CEO of ROW, Throop diversified its operations through a series of acquisitions, including the purchase of Video One Canada – Canada’s largest home entertainment company. In 2003 he took the company public, then orchestrated the acquisition of Koch Records – North America’s largest independent music label – and subsequently changed the company name to Entertainment One. With the company’s comprehensive U.S. Canadian distribution network, Throop began aggressively acquiring the rights for specialty content. In 2007, to fund expansion into independent feature film distribution and rights ownership, he moved Entertainment One to London’s Alternative Investment Market in a $200 million IPO. Shortly after the listing, Throop took Entertainment One on a shopping spree, acquiring leading content producers and distributors around the globe. Stepping up to the main market of the London Stock Exchange in 2010, Entertainment One was confirmed as a FTSE 250 entrant in the FTSE UK Index Series in 2013. From the company’s headquarters in Canada, Throop now directs a talented cast of industry experts that share his vision of actively acquiring ownership of content rights for exploitation across all media platforms worldwide. His success in creating one of the world’s leading entertainment companies was recently recognized at the Grant Thornton Quoted Company Awards where Throop was awarded Entrepreneur of the Year. Throughout his career, Throop has been a staunch supporter of the independent music scene. Today, eOne Music is the #1 independent music brand in North America. To attend the Canadian Music and Broadcast Industry Awards and toast Throop’s notable accomplishments among his peers, visit the Canadian Music Week website at www.cmw.net to purchase tickets and get additional details.